Hi , How much yeast does this recipe call for? It reads, two packets but that doesn’t specify how much. Can live yeast be substituted for dry? Hi! Oops, I meant to put the amount in teaspoons but I forgot. Thanks for pointing this out- I fixed the recipe! One package of yeast is 2 1/4 teaspoons, so it would be 4 1/2 teaspoons total for two packages. I’ve never made this with live yeast, but according to this article, you usually use half the amount of live yeast when substituting it for dry active yeast. Hope that helps! Congratulations ! The recipe is the best ! I did and it got really good ! My yáyá must be very happy in heaven ! Even though I didn’t make it myself, my daughter began baking loaves in honor of her husband, Vasilios, after the first year that he was Chris mated into the Greek Orthodox Church. 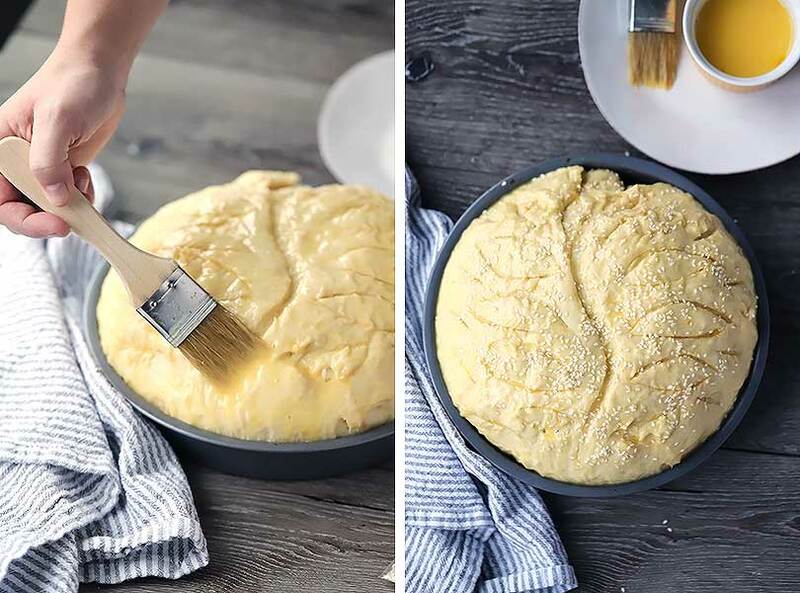 This is the best recipe for vasilopita that I’ve ever eaten! She said it was not difficult and her loaves were as beautiful as the one you posted. 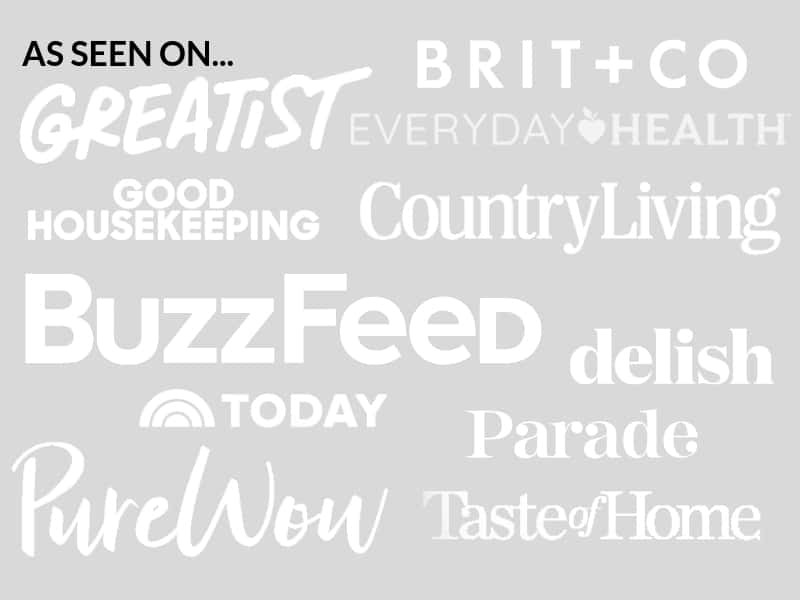 I’m now a fan of your site and am hoping you can suggest an olive bread recipe. Have one to share? Thanks so much for this comment! I’m happy you and your daughter liked the recipe :-) I don’t have an olive bread recipe but I’m just added it to my ever-growing list of recipe ideas for the blog. I LOVE olive bread! 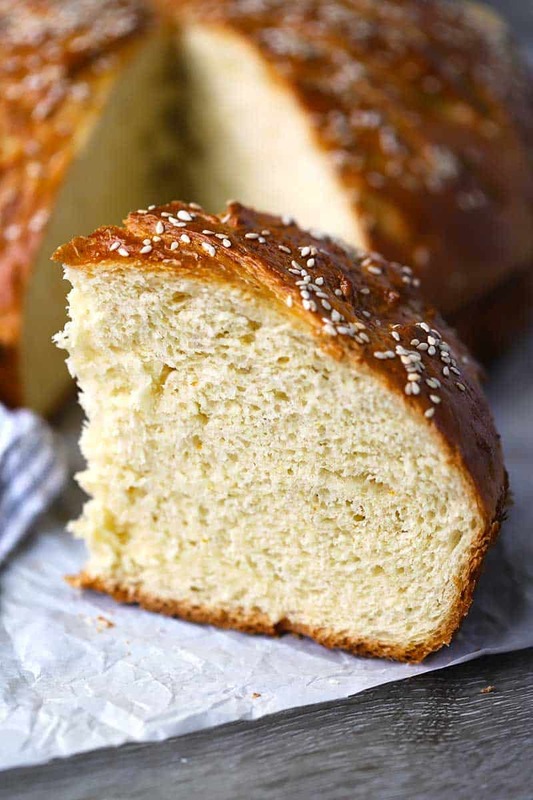 I’ve tried many Vasilopita recipes over the years, but this is definitely one of the best. I like that you proof the yeast first. That helps to ensure a good first and second rise. 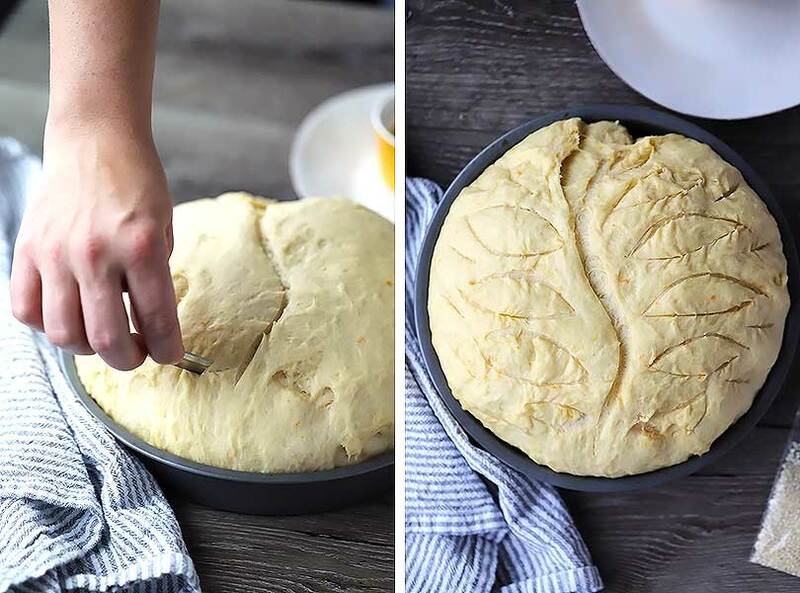 This brought back fond memories of my mother baking the Vasilopita in preparation for St. Basil’s Feast day, and I remember the prayers my grandfather said, as he cut and gave each of us a slice. As a young child, I was humbled by the ritual. The first slice went to Jesus, the second slice to the Virgin Mary, the third slice to St. Basil, the fourth slice to the house and those who live in it, and the fifth slice to the poor so that we will always remember and help those in need. 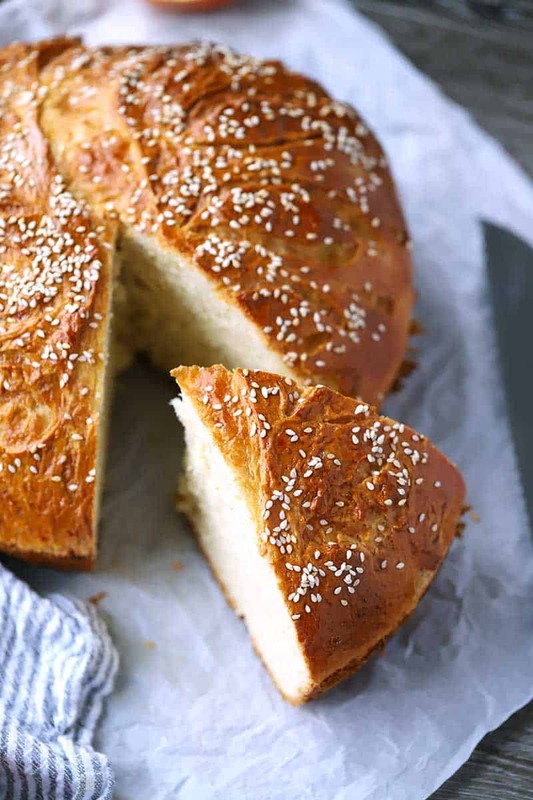 The Vasilopita is a lovely tradition that Greek Orthodox Christians have. Though my parents and grandparents are now gone, I continue with this lovely tradition every year. Oh, I’m so happy this recipe worked out for you! Thank you for sharing this story and happy new year! Made two perfect 9″ loaves. The rising was crazy! Can’t believe how it poofed up. Have great pics if anyone wants to see. I’m so happy you liked it, and that it brought back good memories for you! If you post the photos on instagram be sure to tag @bowlofdelicious- I’d love to see them! We have such a rich tradition and faith. The bread is not baked for the New Year, but as the name suggests, in honor of St. Basil. We do a great disservice when we ethnicize/secularize our religious traditions. This tradition is not exclusively Greek as St Basil was bishop of Caesarea which is in the Holy Land, not far from Nazareth. And the tradition is not derivative from New Year as the Ecclesiastical New year is celebrated on September 1st. We should make a point to share these stories and traditions when and where we can. That being said, this recipe was fantastic. There is also an alternative explanation about the origins of the vasilopita. This story connects both the western and the eastern celebrations to the ancient Greek Kronia, the festival of King Cronus, which involved selecting a “king” by lot and then the Roman Saturnalia. 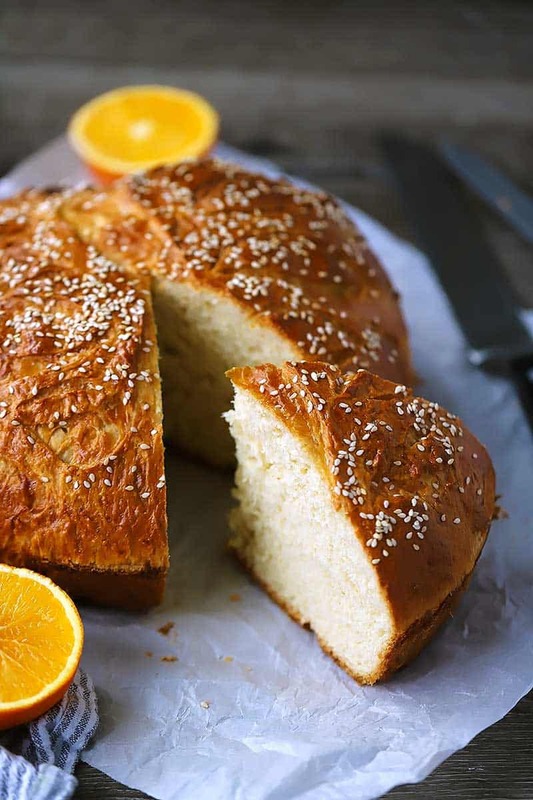 Since 9th century, the vasilopita has been established as a custom in Orhodox tradition. 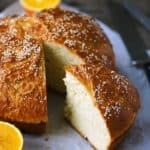 Though the reason for making vasilopita is commonly said to be the commemoration of St. Vasilios, the truth is more complicated: vasilopita is also connected to the ancient Greek breads and cakes which were made specifically for the purpose of religious offerrings to the gods and the spirits of nature and the Roman cakes which were offered to the double- faced Ianus, the god after whom Ianouarios/ January is named. The custom of hidden coin is connected to the Roman Saturnalia, the festival in honor of Saturnus, god of seed and sowing. Saturnalia is thought of as the Greek equivalent of the Greek Cronia, a festival that was held in honor of Cronos, god of agriculture, harvest, fertility and father of Zeus. During Saturnalia a ‘king’ was selected by lot. Hence vasilopita has ancient Greek, Roman and Byzantine background. The word itself comes from the combination of the words vasileus (king) and pita. Vasilopita is a pie for a king. It is generally made in a round shape and can be a common bread, leavened or unleavened or a sweet bread, a sweet or savory pie (pumpkin pie, milk pie, cheese pie, bulgur pie, rice pie, meat pie, fish pie etc.) or something different. Until 19th century, in Arcadia (Peloponnesos) the coin was put into the vasilokota, a stuffed hen (vasilokota = hen for the king). While not technically bread or pie, mention should be made of New Year loukoumades (Aegean islands) and halva (regions of Asian Minor) which also contained a coin. In nowadays the sweet pie, which once was mainly made in urban areas, predominates transformed into a big luxurius cake. From first to last, vasilopita is treated very seriously. In some remote places the pita is still baked by the house mistress, who is clean and wears her best clothes and jewellery for the occasion. Having a deep religious and agricultural significance, it is regarded as the bread or pie of fertility and good luck and is accompanied by actions of magic. Until recently Greek peasants made the sign of the cross before baking it. Keys, needles etc. were used for making strange shapes on sweet vasilopites and breads, intending to lock the gossips or to prevent the evil eye from entering houses. The farmers’ wives made with pieces of dough trees and animals, the shepherds’ wives made dough -sheeps, dogs and pots of milk, the kind St. Vasilios should bless. 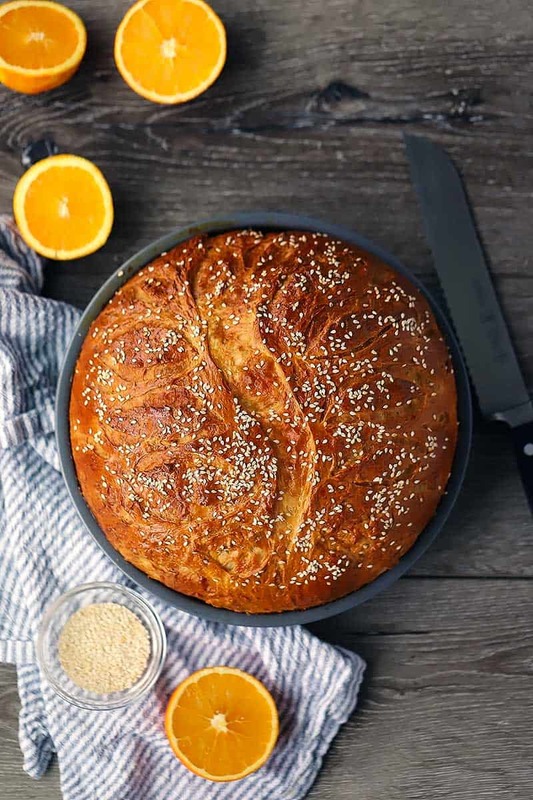 In the savory vasilopita that was made with many phyllo sheets difficult to be decorated, symbols and signs, aside from the coin, were hidden in the stuffing: a small stick for the shepherd, a straw or a grain of wheat for the farmer, a bean or a nut for the fertility of fields and family. When the pie was cut whoever found the straw or the stick in his piece had good luck for his harvest or his animals and whoever found the coin had good luck for himself. On the coming of the New Year the father of the family rotates the pie three times in the name of trinity. Afterwards he makes the shape of cross above the pita with a knife and cut the pie into pieces naming each of them in an established turn. The first piece is for Jesus, the second for Virgin Mary, the third for St. Vasilios, the fourth for the house, the fifth for the poor and stranger and the rest for the members of the family in order of age. The piece for the poor and the stranger is of special interest because symbolizes the duty to care for the unfortunates of the world. Since care for the poor and stranger is not only the basis of philoxenia and philanthropy, fundamental values in Greek social ethics, but also a principle of Christianity, the New Year pie is magical both for the unfortunates and for those who offer shelter to them. The Homeric advice ‘The stranger and suppliant are like your brother. And stranger you are welcome. Our house is yours.” Homer. Odysseus. IX, 546-547 and the Christian ‘I give hospitality to the stranger so that God not become a stranger to me’ have found their echo in a piece of pie. 1 Governor of a province of Roman and Byzantine Greece. Thank you for posting this. Traditionally you combine the yeasst with some sugar to “proof the yeast”. That way if the yeast is bad, you don’t waste all the ingredients. I tried this because the ingredients were like what my mother would use. I don’t understand how just the milk and yeast would double in volume? However, I followed through with the directions. It was for naught because the bread didn’t rise. I don’t know… I don’t use icing on mine! Instead, I carve designs on it before I bake it with a sharp knife. Maybe you can carve 2015 into the dough directly and skip the icing? Otherwise, if you use an icing, I suggest tenting it with foil or using a cake carrier so it doesn’t touch the icing when you are transporting it. Good luck! Just wondering… Directions don’t include adding a second cup of warm milk but narrative does! Mariella- thank you for catching that! Yes, add the second cup like the narrative says :-) Fixing now!